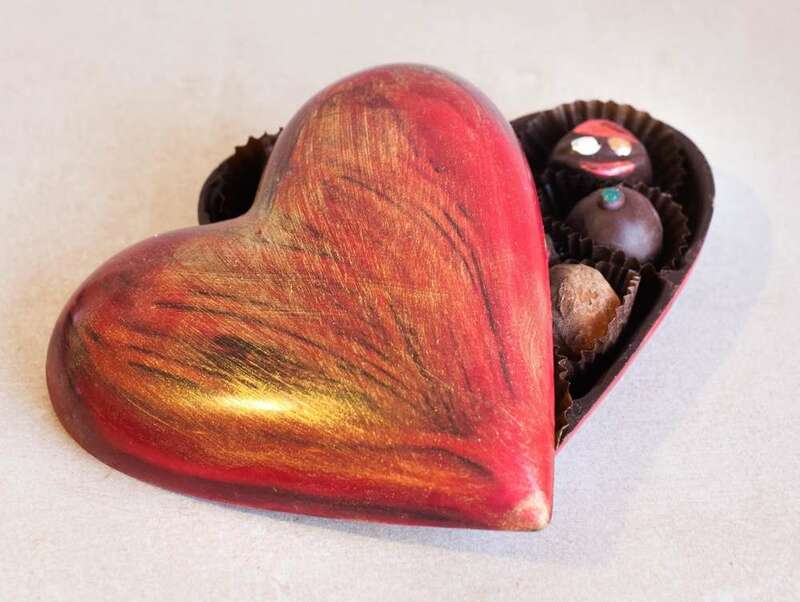 A unique, delicious and beautiful chocolate gift - an edible heart box filled with our fresh chocolates.A lovely gift to celebrate all special occasions. An ideal gift for your wedding anniversary.The chocolate heart is 145 mm wide, weighs approximately 150g, and contains 10 filled chocolates.The heart and truffle shells are made from 75% single origin Tanzanian dark chocolate, and the truffle ganache is made using organic dark chocolate and coconut cream to give a lovely pure taste and great texture.The chocolates come in a variety of flavours which may include: Sea Salted Caramel, Champagne, Vodka-Cherry, Tonka, special origin dark chocolates from Tanzania, Nicaragua, or Madagascar. Also in Coffee-hazelnut, Peanut Butter, Hazelnut, Ginger, Orange, Passionfruit &amp; Mango, Rose Creams, Violet Creams, Dark Chocolate, Tequila &amp; Lime, Champagne, Vodka Cherry, Marzipan, Raspberry.Please use the "Message" box to specify any flavour requirements, or if you would like something excluded/included. E.g. Vegan only, no alcohol.Nutritional values of individual truffles, shelf life and storage instructions are listed on the About Our Chocolates page.Dairy free and suitable for vegans.The pictures are indication only, colours, shades and patterns vary on each chocolate box.Add a gift message:Use the "Message" section below to add your personal message. We will print this on our complimentary card, and include it with your gift free of charge.Alternatively you may choose to buy one of the lovely artisan cards we offer: Buy an Artisan Card. If you do so we will print your message using the card you purchase, and include it with your gift. Do you want to be able to make the best hot chocolate ever in the comfort of your own home? Use our hot chocolate pouches to do so. You can make your own thick, creamy, irresistibly chocolaty hot chocolate. Just follow the instructions that you will find on the packaging, then sit back, allow it to cool, and enjoy. 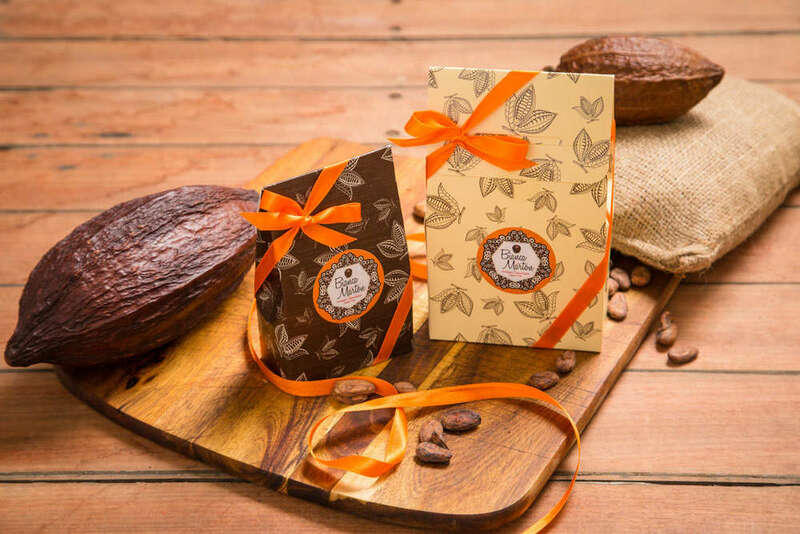 Delicious when cold as well.Pouches contain pure, 66% dark chocolate, ready to be turned into your favourite drink. Hot chocolate mix has a long shelf life. Even if you do not use it all up you may enjoy it for several months after you opened the pack.Weight: Small pouches 90g, makes 2-3 cups, Large pouches 180g makes 4-6 cups.We recommend 30-40g for a 8oz/235ml cup, depending on your preference. To achieve best results please follow cooking instructions included on your pouch.Add a gift message:Use the "Message" section below to add your personal message. We will print this on our complimentary card, and include it with your gift free of charge.Alternatively you may choose to buy one of the lovely artisan cards we offer: Buy an Artisan Card. If you do so we will print your message using the card you purchase, and include it with your gift. 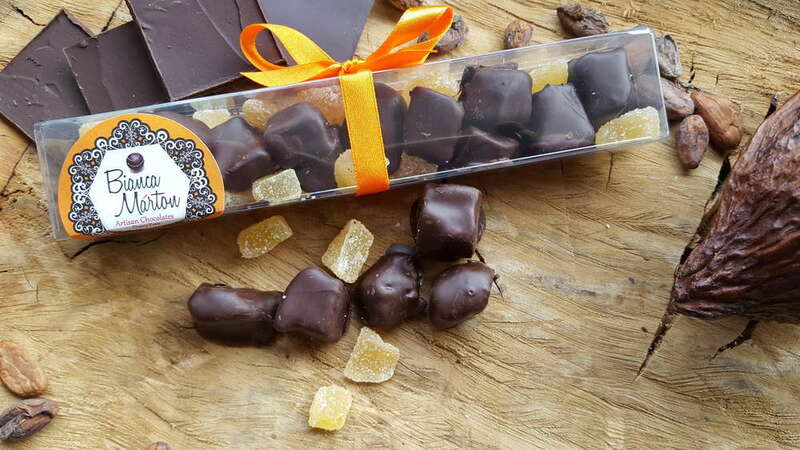 A great selection of delicious chocolate dipped fruits. 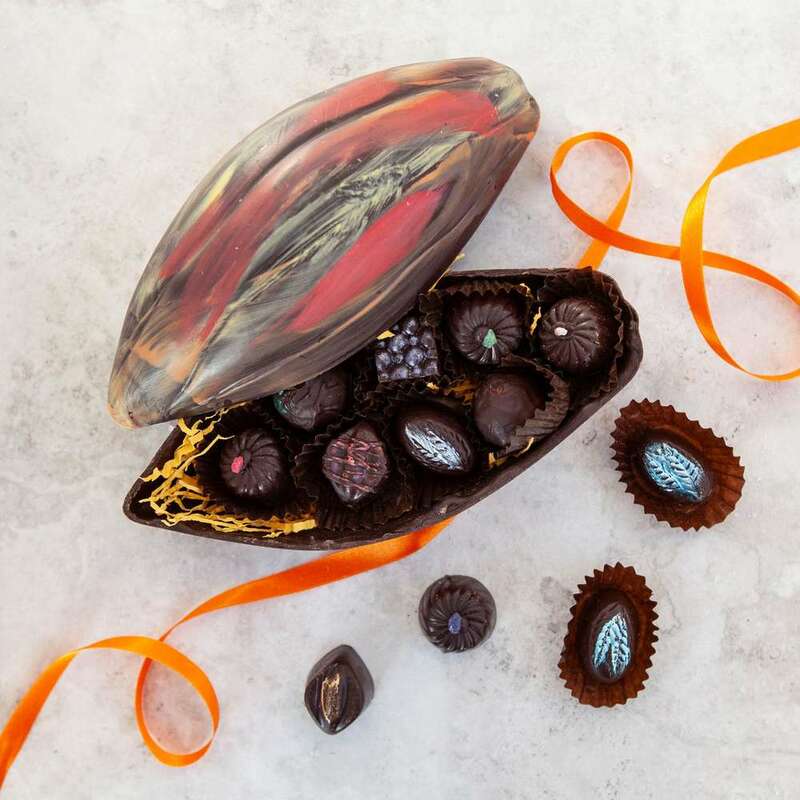 We followed a rigorous selection process to bring you the best fruit selection: delicious as well as responsibly grown and sourced, combined with a pure, delicious 75% dark chocolate. 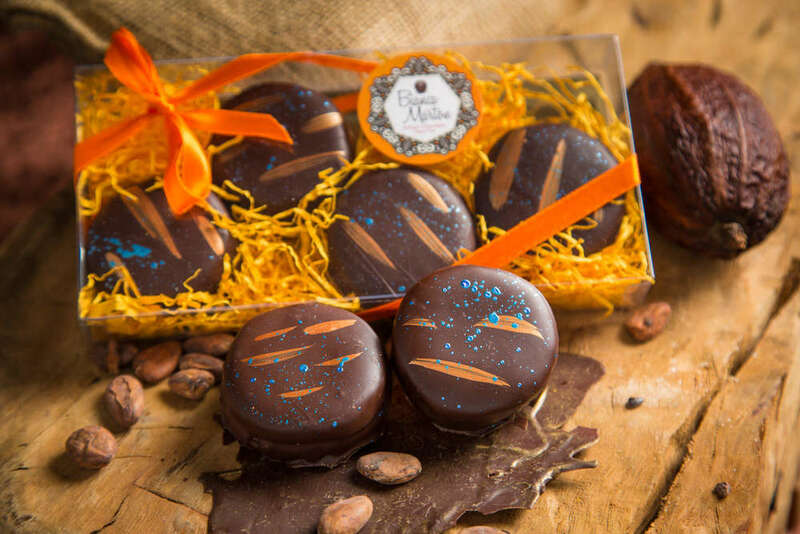 Each box contains:Organic dried apricots: dark, flavoursome treatsOrganic dried mango slices: exciting, sweet and chewy Medjool dates: whole, unpitted dates with sweet honey and dark caramel-like flavours. Organic crystallised ginger: specifically selected for its strength and quality. Harmonious, and distinctive.Dried apple slices: your natural, healthy marsh-mellow alternative. Bursting with flavour, soft and delicious.Please note that the dried apples are organically grown, but they contain sulphites to preserve their natural colour. Our vegan take on this lovely Hungarian delicacy, which is a long standing favourite of mine. I am very pleased to have received a Great Taste star of approval for this product in 2018.Delicious pastry circles enriched with lots of natural ground almonds, pasted together with our own strong raspberry reduction. Naturally, they are dipped in dark chocolate. At 2"(just over 50 mm) in diameter, they are the perfect size of a dessert to accompany your tea or coffee.Box of 4 pastriesAdd a gift message:Use the "Message" section below to add your personal message. We will print this on our complimentary card, and include it with your gift free of charge.Alternatively you may choose to buy one of the lovely artisan cards we offer: Buy an Artisan Card. If you do so we will print your message using the card you purchase, and include it with your gift.